Are you going to a costume party and want to make sure that you arrive dressed in a way that no one can forget? Do you want to make sure that you--haunt the dreams--of every partygoer with the sheer horror of your costume? Or maybe the party is just located on Elm Street and you want to dress appropriately! Regardless of the reason, we have the perfect costume for you. Yes, this Adult Freddy Krueger Shirt with Mask is the ideal solution for your eerie needs. Think about it, what better way to be as memorable as possible than as the original Master of Nightmares himself? Nobody will be able to close their eyes to fall asleep without seeing you--yes, you!--lurking just out of sight, ready to terrify them throughout their REM state. Just remember to work on your sinister laugh and your evil plots, so to best get at each of your victims….ahem, friends. This striped long sleeve shirt is legendary and as instantly recognizable as you are, from the moment you enter the room. 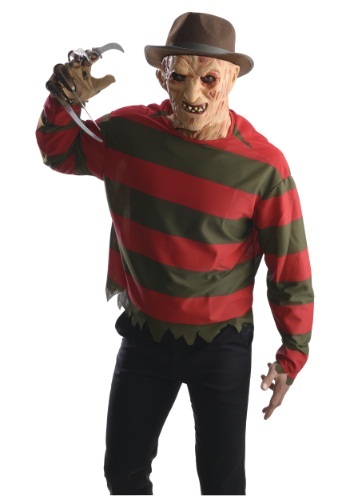 It has jagged edges at the neckline, hemline, and sleeve cuffs that match the horror of the included mask (which will transform your normal face into the burned away flesh of Freddy himself). Pick up the gloves and hat as accessories to your crime and finish off the look that will haunt the nightmares of your friends for days to come!